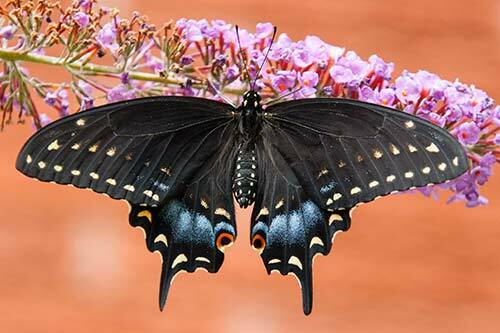 Black Swallowtail butterflies, the (eastern) black swallowtail (Papilio polyxenes) is a gorgeous large butterfly. 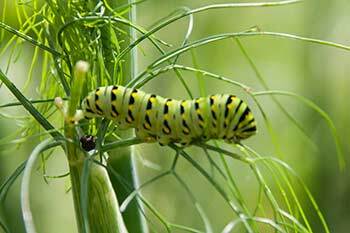 I see them regularly in my back garden and find the stunning yellow-green and black caterpillars in the vegetable garden, particularly on the fennel, but I've also seen caterpillars on dill, Queen Ann's lace, and parsley. The grown butterflies will visit many of the usual plants to feed. I often see them on the butterfly bushes, on the purple coneflowers, on zinnias and various daisies, they really like milkweed when it's flowering and they will visit catnip and bee balm along with loads of other insects. Males defend a territory so I see more females than males since whoever has the territory chases other males away. They also fly really fast so they are hard to photograph. Male and Female look different. The male has much more yellow and much less blue. It has a prominent row of yellow dots along its wings. The female, which is often larger, had more blue and very subdued yellow dots. Both male and female have the eye like marking on the lower wing. Females lay one eggs on her chosen plant. She can then go on to another plant and lay another egg but they are not found together. 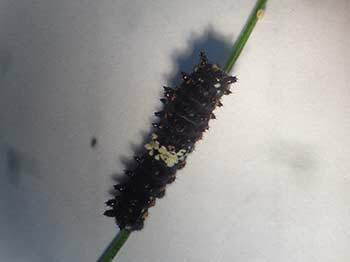 After a few days, 4-9, timing depends on temperature, a very tiny caterpillar comes out. The caterpillar has only one goal in life, eat, Oh and poop. It grows quickly and molts several times, leaving a pile of black leftover leg and head parts behind. 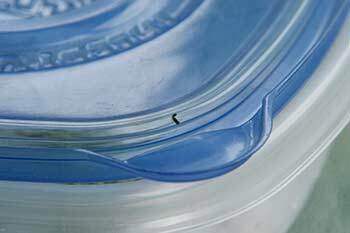 The caterpillar stage can last only a couple of weeks or stretch out to over a month depending on temperature and food supply. 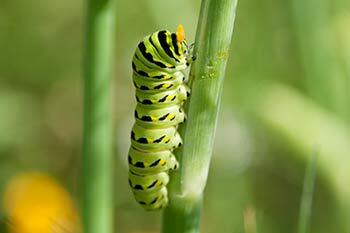 The caterpillar then pupates. 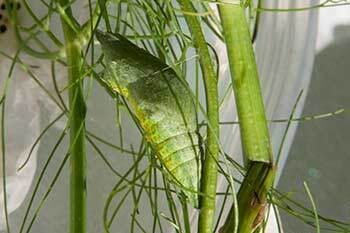 It makes a cocoon and finishes maturing half dangling in its chrysalis. Time spent doing this can be very short 18 or so days, or the caterpillar/pupa can spend the winter before coming out. 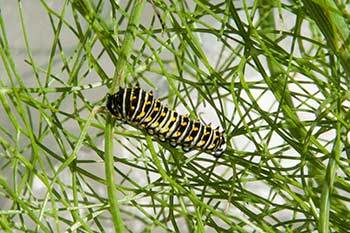 I plant fennel because I know it attracts black swallowtail who like to lay their eggs on the leaves . It also attracts other pollinators who like the flowers. Not only that the leaves have a lovely licorice tast that's great in salad. 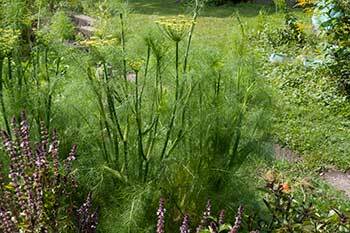 Everyday when I go to the garden, I check the fennel for caterpillars and occasionally I also find an egg. They are very small and hard to find. If there is one egg, the lady butterfly might have laid another one nearby so I try and find as many as possible. When I find an egg I collect it and raise it separately. 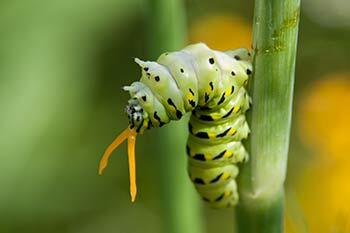 Because I have a lot of wasps and other predators in the garden, not many caterpillars live to become butterflies. That's good if you are growing a garden but not so good if you also like butterflies. All the plants are patrolled by spiders and wasps, plus countless other unidentified bugs. 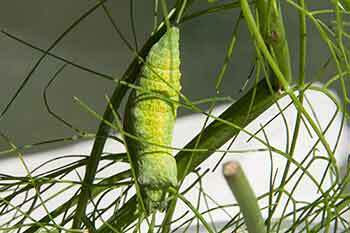 Although I've never seen this, I think the swallowtail baby eats it's egg shell for nutrients. I've seen Monarch do this, also I have never found an empty egg after the swallowtail has hatched. These babies are really small but they have HUGE appetites. The faster they can grow the less time that they will have be seen and eaten. After a couple of days the baby caterpillar has more than doubled in size and has molted once. It will molt 4 times each time getting larger and changing it's appearance. At first it is black and spiny with a white saddle, it then gradually changes colour and gets rid of its spine. The 4th and 5the instars are green yellow and black with no spines. 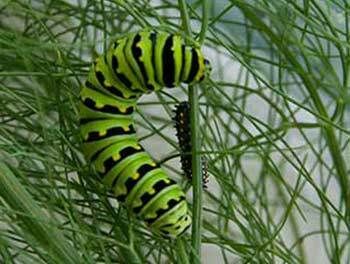 A swallowtail can strip a plant very quickly particularly when the are full grown. They cling solidly with their many feet and don't fall out even in strong wind. 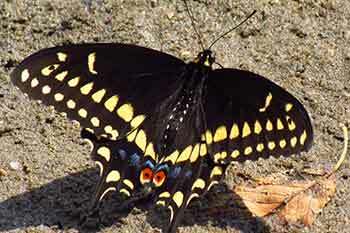 Swallowtail create a great amount of droppings called frass. You can see some just below the butterfly. Sometimes you can find the little dark green balls and this gives you an indication that there are caterpillars around. Apparently they can fling their frass away from themselves to prevent predators from finding them. 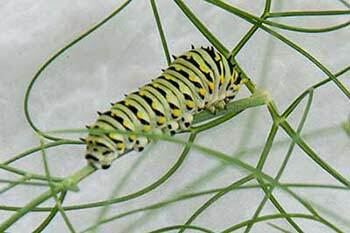 Another way of finding caterpillars is looking for eaten up plants. The caterpillars look lovely on photographs but their colouring is really good camouflage and they are hard to see even if they are right in front of you. 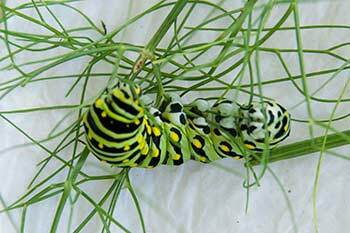 Swallowtails have little horns they can extend if you touch them. 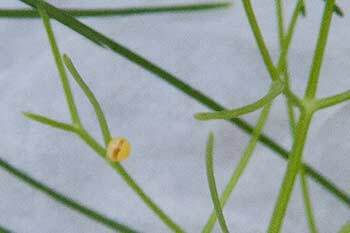 These are called osmeterium. They secrete a really strong smelling protective repellent. It's harmless to humans. Here I've just touched the caterpillar and he's bending over backward to cover me with this scent. It has a strong smell and stays on even after a couple of hand washings. She did not touch me and the smell was still strong on my hand. The cocoon or rather Chrysalis is not spun silk but rather part of the transformed skin of the caterpillar. It is attached at the bottom by a little silk button and there are 2 silk threads in the upper third of the chrysalis that allow it to sort of dangle against the branch. There is quite a range of colour from almost beige to brown to various shades of green. There is a lot of variation in time before the butterfly comes out. Sometimes it can be just over 2 weeks and other times several months to over winter. So if you have a cocoon that is not doing anything after what seems like a long time, don't give up. The new butterfly crawls out of the chrysalis and sort of dangles down for an hour or so. At first it is really floppy with no stiffness at all, gradually it pumps some sort of hydrolic fluid fluid to stiffen the wings. After a short while it slowly opens and closes the wings. The whole process takes a couple of hours. They usually come out in the morning. I've moved the semi dry caterpillar outside in the sunshine to finish solidifying her wings. 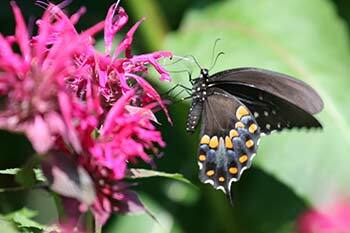 The Bee Balm (monarda) attracts many butterfly. 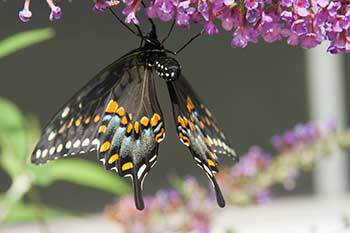 Black swallowtail on Butterfly bush shows its lovely underside colours. The colours are said to mimic another less tasty butterfly. 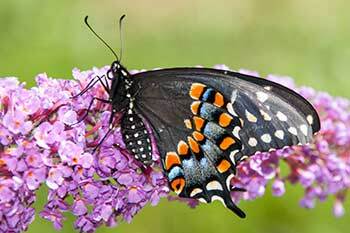 The Black Swallowtail can regulate it's body temperature by either exposing more of its abdomen to the sun. It does that by spreading it's wings and putting up the abdomen higher to catch some rays. If it's too hot outside it uses its wings to shade the abdomen and not absorb as much heat. 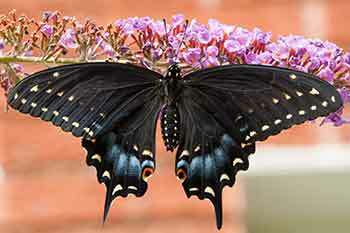 Article about the life cycle of the black swallowtail. 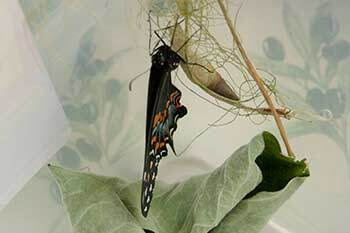 More life cycle of the black swallowtail, with very good photos from Wisconsin-Madison Master Gardener Program. This information is for general knowledge. Some people are sensitive to milkweed sap and the plants are sometimes poisonous to humans and pets in various degrees. Cats are particularly sensitive to poisons so don't let them eat any part of the milkweed plant.